Morgan Stanley Calls It: "We Are In A Bear Market"
On Friday, with the Dow surging on what proved to be failed hopes that the trade war with China is coming to an end, JPMorgan head quant Marko Kolanovic quadrupled down on his now weekly call urging clients to buy the dip, this time saying that "equity market sentiment is held back by two key risks: the Fed hiking beyond the neutral rate and escalation of global trade war." To justify his relentless optimism, Kolanovic referred to "Trump’s statement that he may not need to impose more China tariffs and that the “China list is pretty complete, four or five things left off” (from the original list of 142 requests, i.e., 96% of items have been addressed)"and added that "naively interpreting the likelihood of a deal by the number of items addressed would indicate a significantly increased probability of a trade deal." Of course, following this weekend's collapse in Sino-US diplomacy at the APEC summit, which for the first time in history ended without a joint communique, we know that this is not the case. The JPM quant also pointed to the recent shift in sentiment by the Fed's chair and vice chair, and referring to the statement by Richard Clarida, suggested that "the Fed may stop at the neutral rate (rather than continue hiking beyond the neutral rate), which might be interpreted as an effective rate cut." Then again, as Nomura's Charlie McElligott explained this morning, the "bull steepening" in the curve indicates that far from a bullish resolution, the Fed's dovish relent is actually bearish "because growth is decelerating, fiscal stimulus impacts are rapidly diminishing, financial conditions are net / net “tighter” and policy nearing the level where it is no-longer “stimulative." In any case, for the above two reasons, and along with record levels of Q4 buyback activity, Kolanovic concluded that "the pain trade, and therefore most likely outcome, will be the market going higher into year-end." Well, maybe not... because one look at the market which is down almost 2%, with the Dow plunging 450 points and the S&P back under 2,700 would indicate otherwise. Meanwhile, taking the other side of the bet is Morgan Stanley's bearish chief equity strategist, Michael Wilson, whose year end price target on the S&P is 2,750, the lowest of all Wall Street strategists whose average prediction is that the S&P will close above the record high of 2,930.75 hit in September and who warns again that "If it Looks like a Bear and Trades Like a Bear, Stop Trading it Like a Bull", and then just in case he wasn't clear, explains "We are in a Bear market." To make his point, Wilson notes something we first brought attention to back on October 24, namely that in 2018 "buying the dip" has been a negative return strategy for the first time in 13 years. Not only does the price action this year suggest we are in the midst of a bear market--more than 40 percent of the stocks in the S&P 500 are down at least 20 percent--but it also trades like a bear market. According to analysis from our QDS colleagues, buying the dip has not worked in 2018 for the first time since 2002. Such market behavior is rare and in the past has coincided with official bear markets (20 percent declines), recessions, or both. 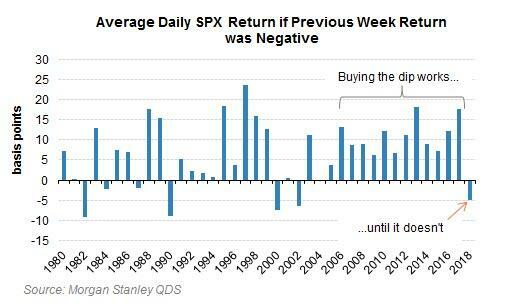 To demonstrate this point, Morgan Stanley looked at rolling five-day declines in the S&P 500 Index this year and found that on average, the sixth day also generated a loss: of 0.05 percent. And while the drop is small, as Bloomberg notes, it’s a big departure from the past 16 years, when dips gave way to gains. And sure enough, it happened again today with the S&P falling 1.6 percent as of noon ET after a decline last week. More ominously, Wilson notes that what's notable about Exhibit 1 is the fact that the only years the Buy the Dip hasn't worked was during bear markets, or the beginning of one (1982, 1990, 2000, 2002). In the cases of 1982, 1990, and 2002 it was also accompanied by a recession. In the case of 2000, it was the year preceding a bear market and recession and the topping of the TMT bubble. In other words, while 2018 is clearly not a year of recession, the market is speaking loudly that bad news is coming. Our view is that the market is sniffing out an earnings recession and a sharp deceleration in economic growth--something we have written about extensively. To be sure, there are exceptions: did buying dip work in 2008-09, however Wilson has a specific explanation for this: "in 2008-09, the Fed was easing aggressively and began its QE program along with TARP. That's a lot of stimulus that probably offset the very real concerns about the economy and corporate earnings." Furthermore, Wilson adds, while the S&P 500 was down in both 2008 and 2009, buying the market on weakness was still a profitable strategy because the rallies were just as vicious given the incredible uncertainty and unprecedented volatility which also made it almost impossible to execute. 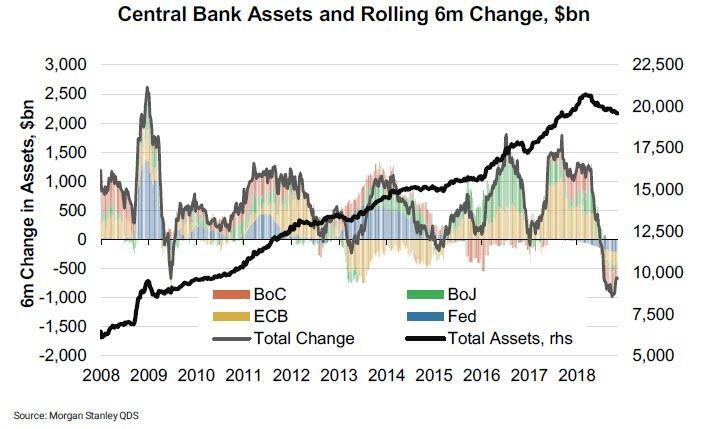 However, this year has been different because as shown in the chart below, monetary stimulus is being removed in a much more deliberate way than we have seen since 2004 and fiscal stimulus has peaked. So unlike JPMorgan, the bottom line for Morgan Stanley is that until we see buying the dip rewarded or earnings for next year reduced to a level that is achievable, "we recommend trading like it's a bear market rather than a bull." Still, despite Wilson's bearishness, there is a point of convergence between the bank's bearish outlook and Kolanovic's bullishness: the Morgan Stanley strategist estimates that 90% of the valuation damage from the "rolling bear market" is done now that the S&P 500’s forecast price-earnings ratio has contracted 18% from its December peak, suggesting that one final flush may be all that's needed to clear out the selling overhang. Additionally, he writes, "the good news is that bottom up 2019 EPS forecasts are finally coming down, albeit slowly. We think this will be a long arduous process as companies are slow to acknowledge margin pressure, top line weakness, or both. So far, the biggest cuts have come from Growth stocks." Still, he urged investors to stay away from stocks that have fetched higher multiples. “We thinks the risk from here is much more at the stock level and will likely be concentrated in the higher multiple stocks that do not deserve a valuation premium but have simply benefitted from a crowding effect. Nvidia's price action last week is a good example of that remaining risk." Come to think of it, Nvidia's price action today is also a good example of that, which begs the question: with the bearish thesis once again winning, will Marko Kolanovic qunituple down on his bullish call, or will he finally throw in the towel and join the bearish side?